Wisdom is the essence of Dakini. Each line of this practice opens a facet of the jewel of their presence. This practice is complete and simple, it reflects the power of its discoverer. Adzom Rinpoche, one of the most important Dzogchen masters in Tibet today, had a direct vision of Yeshe Tsogyal about ten years ago when he visited her sacred soul lake. 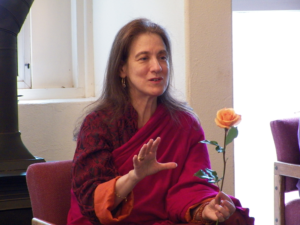 The unique practice that we will learn during our retreat is the result of that encounter. According to the ancient (Nyingma) Tibetan traditions, this is considered a treasure (Ter) hidden by Guru Rinpoche in the 8th century to be found at the right time by an appointed person, in this case Adzom Rinpoche. This practice is now part of Rinpoche’s own treasure cycle, the Heart Essence of Clear Light (‘Od gsal snying thig). Adzom Rinpoche has asked Lama Rigzin Drolma (Anne C. Klein) to teach and comment on this profound practice.